If you’re just starting out bullet journaling and still experimenting with the whole process, budget bullet journal supplies can be a life saver. I remember when I first started out and saw all the different supplies that were out there and how much some of them were. Note: This post contains affiliate links. For more information read my disclosure policy. I was overwhelmed, and I could just see the receipts piling up. I wanted to try everything! But I definitely couldn’t afford to try everything. Plus, what if bullet journaling wasn’t for me? Even now that I love bullet journals and have a more established collection of supplies, I still like getting a deal when I can and these budget bullet journal supplies are where its at! See my reasoning above for why they’re worth it. These give you a finer point that helps give variety to your lettering and doodles. Plus, who doesn’t like Crayola? 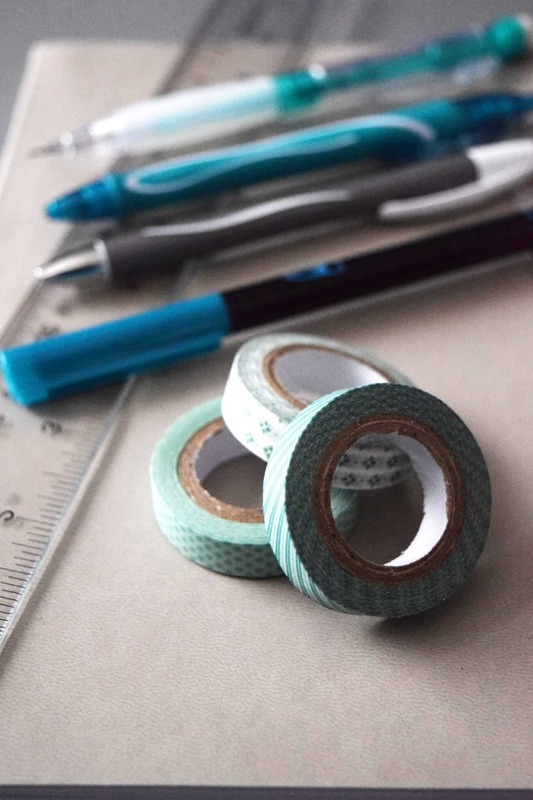 There are endless options for washi tape and they are almost always affordable. While craft stores can be a little pricier, there are amazing sets of the stuff on Amazon for under $10. Washi is also typically cheaper than sticker sets and can dress up your page or help you flag important events without a lot of time spend doodling. A decent set of pencils can take you a long way. It helps you sketch everything out ahead of time before you pen it in, and honestly sometimes if I’m in a hurry I just use pencil alone. You want some that are going to give you decent payoff and have a good eraser. I like these because they have a good grip and nice erasers, but you could just as easily use a simpler standby like Ticonderoga and save a bit more! Speaking of erasers – you want a good one. You’re going to make mistakes. It’s inevitable. If you’re anything like me, you make at least one mistake every time you set up a layout. A good eraser that can take those mistakes away like magic is key, but you don’t need to spend a fortune on it. The biggest things I look for are minimal crumbling and colorless. These Staedtler’s are perfect, and a pack of them will last you a loooong time even with all the mistakes I make! This is where bullet journaling can get nuts. There are gorgeous top of the line fountain pens out there for hundreds of dollars and they are amazing if that’s your thing. But, you definitely don’t need one to have a great bullet journal. I just recommend getting some that have good quality ink and a comfortable design to hold. The BIC Atlantis pens are my favorite for cheap but reliable pens! When you’re setting up your weekly and monthly spreads it’s much much easier to get the lines you want if you have a ruler to help guide you. I like the variety of having a small one and a larger one depending on how much detail I’m working with and how many times I have to turn my ruler around to get the layout I’m going for. Once you’ve got your supplies, you can start filling out your bullet journal with collections and habit trackers!